Over the past decade, Chinese-language digital and social media have grown into a vibrant and complex sector, both in the People’s Republic of China (PRC) and globally. WeChat, the most popular of the social media platforms, is problematic in Australia because it relies on only partially encrypted messaging, leading to concerns about possible PRC government surveillance and censorship. Digital and social media dwarf traditional Chinese language media such as radio, television and newspapers in terms of reach, revenue and impact. In January 2019, WeChat announced that it had surpassed one billion daily active users. 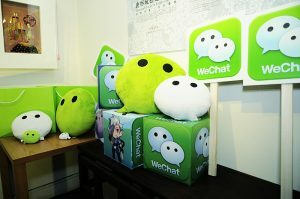 The rapid growth of WeChat in Australia, combined with the PRC’s history of censorship and interference in its domestic media and technology organisations, has led to speculation about possible security risks and political interference within Australia. The main security concern about WeChat appears to be that the PRC government could use WeChat to conduct political, military or industrial espionage in Australia, or seek to undermine Australia’s democratic processes. These may be valid concerns. However, evaluating their validity is impossible; this is a critical challenge that lies outside the scope of this policy brief. But assessing the nature and level of these concerns, outlining the reasons behind the underlying misconceptions, and identifying constructive avenues for politicians and businesses are also important. Thus, while there are problems with WeChat in Australia, there are also problems with the framing and conceptualising of the issues involved. • that WeChat censors content so publishers in Australia (and the PRC) cannot post material that the CPC deems sensitive. WeChat, like Facebook and Twitter, is a social media platform that carries wide-ranging and diversely-sourced content; its ideological landscape is fragmented and contested, despite the CPC’s heavy-handed attempts at control and censorship. There is a crucial distinction between WeChat being subject to the PRC authorities’ censorship and WeChat being an instrument of CPC propaganda. So, while some of the content carried on WeChat is bound to be propaganda, much of the content is produced by diverse sources that are subject to censorship but are not propagandists. We should not treat the WeChat platform as little more than a propaganda machine. The second misconception is that the users of Chinese-language social media are almost all Chinese speakers, and that few Chinese speakers use mainstream English-language social media. WeChat certainly is a Chinese social media platform, but it has a global presence, and is used by many non-Chinese speakers. According to one study, up to 38 per cent of WeChat users in Australia are not native Chinese speakers.4 Also, many Chinese-speaking migrants in Australia communicate in Chinese on mainstream social media platforms such as Facebook, Twitter and WhatsApp as well as on WeChat. The third misconception is that all Australian WeChat users are automatically subject to censorship by WeChat or the CPC. WeChat does censor posts and private communications that are sent or received on accounts that were opened with a PRC phone number. This includes many Chinese who now live in Australia. There is evidence that WeChat accounts created with non-PRC phone numbers can share material considered sensitive by the CPC with other international accounts, but not with accounts linked to a PRC phone number.5 The latter have the option to create a separate account with an Australian phone number, although that may limit their access to some of WeChat’s e-commerce features. Further, there is nothing to prevent the PRC government from requiring WeChat to adopt more sweeping censorship practices in the future. Finally, WeChat’s poor track record in relation to CPC surveillance within the PRC leads to concerns that WeChat poses cyber-security and espionage risks to Australia’s national security. Australia has banned Defence personnel from using the app on their work phones. The platform only encrypts data between the user and its own servers, not end-to-end, leaving all its traffic potentially open to government interception and control.6 This means that that the PRC government can possibly surveil private conversations on the app throughout the world. Thus, Australian users have good reason to be concerned about possible privacy issues. But many communication channels back to the PRC carry a similar risk of surveillance, so it is not a problem unique to WeChat. So far, according to Meg Jing Zeng, there is ‘no firm evidence’ to suggest that WeChat has been used for PRC government espionage in Australia, nor is there tangible proof that the widespread use of WeChat will make Australians more vulnerable to hacking or any other form of cyber-attack.7 The PRC most likely has much more effective technologies for hacking and digital espionage than WeChat. Nevertheless, commentators have expressed a number of concerns – for example, that ‘China may use WeChat’s success here to further interfere in Australian internal affairs’.8 If evidence exists showing that these fears have materialised, it should be made public. Despite this, concerns about possible cyber-security risks associated with WeChat persist. Three factors further compound this fraught issue: first, there is a strong ideological distrust of the CPC, and an acute awareness of its appetite for intelligence-related data – as is also the case with many other governments. Second, accurate assessments of the risks require technological expertise that is mostly opaque to non-specialist commentators and the public. Third, the secretive nature of national intelligence gathering practices makes it difficult for public commentators and the public to assess whether WeChat poses risks. Evidence of the connection between the PRC’s WeChat surveillance and Australia’s national security has not been made public. Despite concerns over the use of WeChat in the 2017 Bennelong by-election to circulate a politically charged letter which criticised the Liberal government, there was little evidence of widespread electoral interference via WeChat. The Liberal Party won the by-election. But there is plenty of evidence to suggest that WeChat can be – and has been – used by Australian political parties and politicians to try to win votes. The Coalition’s success in using WeChat to win marginal seats in the 2016 federal election is a case in point. After Chris Bowen became the first Labor politician to utilise WeChat to reach out to Chinese-Australian voters in a live, interactive chat, a number of politicians have subsequently set up WeChat subscription accounts. Recently, Prime Minister Scott Morrison opened a WeChat account in the hope of connecting with the Chinese-Australian communities, and Opposition leader Bill Shorten went live in a WeChat question-and-answer session with nearly 500 Chinese-Australian voters. However, some politicians also rely on WeChat to deliver messages to Chinese-speaking communities that differ from their messaging to the wider public. For instance, while both Bill Shorten and Scott Morrison used WeChat to denounce National Senator Barry O’Sullivan’s ‘Chinaman’ remark in response to community sentiments expressed on the platform, the Chinese communities also noticed that Morrison’s statement was made only in Chinese, on WeChat, and not to the wider English-speaking public. While the Australian business sector has been quick to exploit WeChat to reach the Chinese-speaking markets, self-proclaimed entrepreneurs have also readily adopted WeChat to engage in myriad business practices. These range from daigou (a relatively benign form of purchase-by-proxy trade) to more questionable ways of making money, which so far operate under the radar of regulatory bodies such as the Australian Competition and Consumer Commission. Furthermore, the platform’s potential as a resource in people-to-people diaspora diplomacy has not been tapped. Politicians and Australian government departments could also use WeChat to promote Australian democratic values and ethics, and an ethos that better reflects our multicultural society. 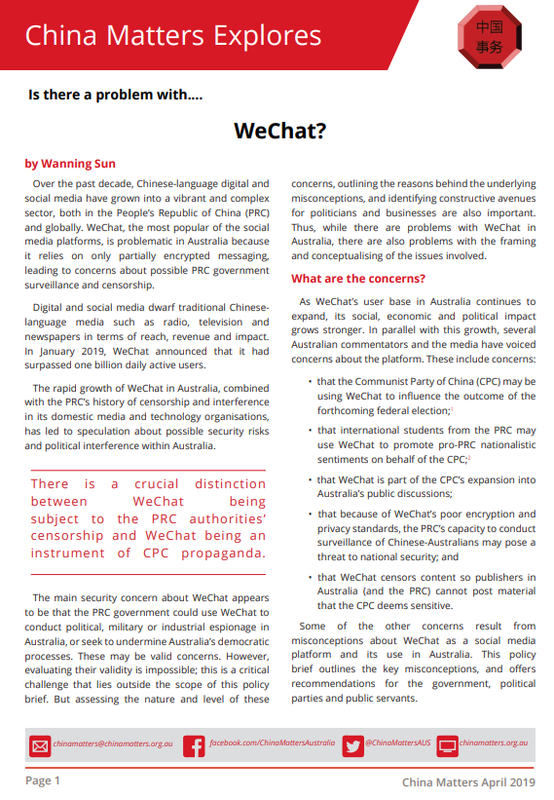 Allowing misconceptions surrounding WeChat to persist perpetuates an inaccurate and potentially damaging public understanding of the complex nature of the PRC’s censorship, foreign influence and propaganda efforts, and the actual ways in which these efforts may manifest themselves in Australia. It also passes up enormous political and business opportunities. Politicians and Australian government departments could also use WeChat to promote Australian democratic values and ethics, and an ethos that better reflects our multicultural society. Australian media organisations should employ more staff with Chinese language skills, so they can interact with and report on WeChat. The Australian media workforce is less diverse than the broader Australian society. Education about the political, social, cultural and economic – as well as security – aspects of WeChat is important. Learning about social media in Asia, including WeChat, should become a routine part of journalism training and media studies. Working journalists should be required to have a basic understanding of how social media works in Asia and in Australian diaspora communities. The Australian government should release the findings of any research, if such exists, that assesses whether, and how, the CPC uses WeChat to conduct espionage or threaten national security within Australia. Government departments involved in service delivery should consider engaging Chinese-speaking groups using WeChat to improve delivery. Politicians should aim for consistent messaging across the breadth of Australian society. Targeting Chinese-speaking communities via WeChat could backfire. Politicians should adopt a code of conduct to ensure that any message broadcast to Chinese communities is also translated into English on their official websites. Multicultural education policy-makers at both federal and state levels should consult Chinese-Australian communities, and think tanks to identify concrete ways of using WeChat to facilitate civic education, multicultural integration and social cohesion. Government departments involved in public diplomacy such as Home Affairs, Foreign Affairs and Trade, and Education should use WeChat to engage in public diplomacy with the PRC, and to promote Australia. Political parties and politicians tend to use WeChat as a top-down, sender-to-receiver instrument. They should actively explore ways of using WeChat to understand the sentiments of these communities. Wanning Sun FAHA is Professor of Media Studies at the University of Technology Sydney. She is the author of a major report “Chinese-Language Media in Australia” (2016), and a Chief Investigator of an Australian Research Council Project “Chinese-Language Digital/Social Media in Australia: Rethinking Soft Power” (2018-2020). Prof Sun is currently co-hosting (with Peter Fray) “The Middle”, a radio program and podcast on Australia-China relations. This policy brief is published in the interests of advancing a mature discussion of WeChat in Australia. Our goal is to influence government and relevant business, educational and non-governmental sectors on this and other critical policy issues. In the latest edition, Prof Wanning Sun says the Chinese social media platform is problematic in Australia because it relies on only partially encrypted messaging. But she also debunks many of the myths and misunderstandings underlying one of the fastest growing social media apps in the world. Sun points out there is much speculation about WeChat’s susceptibility to security risks, PRC government surveillance, and political interference in Australia, before dividing the various suspicions into misconceptions and legitimate risks. Additionally, the author assesses the challenges and opportunities associated with WeChat and the political process in Australia. The policy brief culminates in several policy recommendations. Sun urges Australian media to employ more Chinese-speaking journalists so they can interact with and report on WeChat. She also suggests the publication of government research, if there is any, into WeChat’s encryption safety; and the provision of education to public servants on WeChat best practices, to enhance its use for public diplomacy. Is there a problem with PRC Aid to the Pacific?, authored by Dr Graeme Smith.